Woo-hoo! Or is that choo-choo? 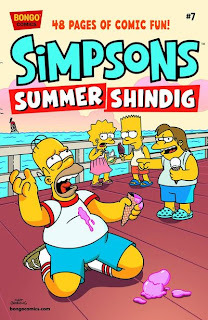 Just in time for summer, I'm back in the funny pages at the end of next month, sending the Simpsons on a railroad vacation in Simpsons Summer Shindig #7 from Bongo Comics! I've been hip-deep in prose-world with Star Wars: Kenobi and Overdraft: The Orion Offensive this year — but another of my Simpsons tales has been slotted for the big vacation issue, shipping May 29. "Railroaded" is a fun piece which finds the Simpsons on their way out of Springfield on the Silver Flash, a passenger train that turns out to be less than they'd hoped for — and more than they bargained for! I've done a lot of train travel in recent years — including with my son, the railroad nut — and the story was a lot of fun to write. The issue also includes several other stories, by Ian Boothby and the whole Simpsons comics gang. This is my fourth Simpsons story — I was also in Bart Simpson #76 and #77 last year — and they're always a blast to work on. Preorder it from your local comics shop, or here!